Our Vision, Mission and Values Guide Us in Everything We Do. Our company’s Vision, Mission and Values are the cornerstones of our culture. They guide our global strategy, define our overarching goals, and serve as a constant reminder of Jacobs’ high performing, innovative and empowered culture. Our Vision, Mission and Values are inspired by our teammates, our rich history, and our promising future. 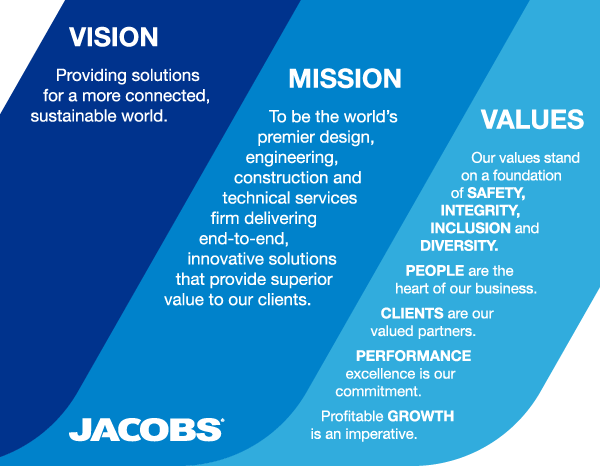 For 70 years, Jacobs has been the driving force behind some of the world’s greatest engineering feats. These guiding principles help ensure that our company will continue to provide solutions for a more connected, sustainable world for many years to come. Connect with us on LinkedIn, Twitter, Facebook and Instagram.